This document describes how to use Open vSwitch is to isolate VM traffic using VLANs. This network is not strictly required, but it is a simple way to give the physical host an IP address for remote access, since an IP address cannot be assigned directly to eth0 (more on that in a moment). eth0 is connected to the Data Network. No IP address is assigned to eth0. eth1 is connected to the Management Network (if necessary). eth1 has an IP address that is used to reach the physical host for management. When you add eth0 to the OVS bridge, any IP addresses that might have been assigned to eth0 stop working. IP address assigned to eth0 should be migrated to a different interface before adding eth0 to the OVS bridge. This is the reason for the separate management connection via eth1. 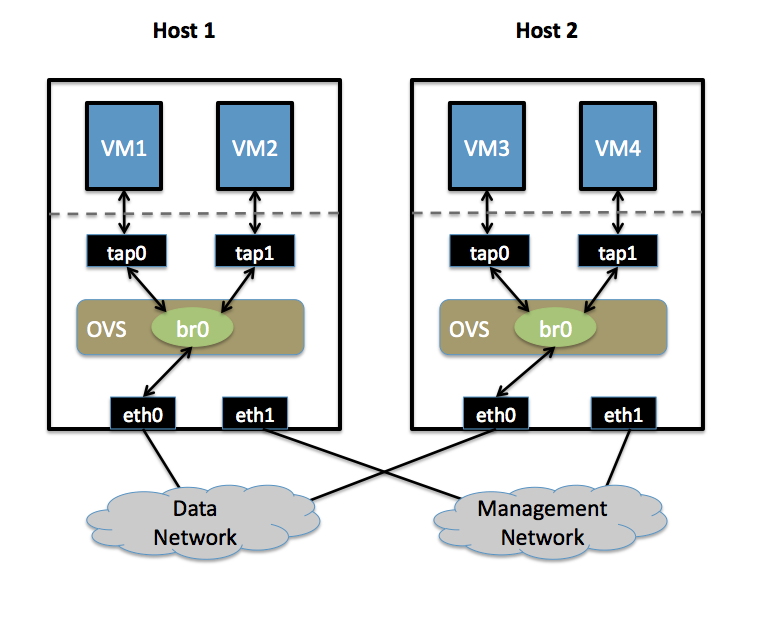 Pings from vm1 to vm3 should succeed, as these two VMs are on the same VLAN. Pings from vm2 to vm4 should also succeed, since these VMs are also on the same VLAN as each other. Pings from vm1 / vm3 to vm2 / vm4 should not succeed, as these VMs are on different VLANs. If you have a router configured to forward between the VLANs, then pings will work, but packets arriving at vm3 should have the source MAC address of the router, not of vm1 .